When inserting a video shot into the composer storyboard, several options are available for the audio track. Main-track only - the audio of the inserted clip will NOT be heard, only the audio of the main track. Clip Only - only the audio of the inserted clip will be heard and the main track will be completely faded out. Fade main track - both the audio of the main track and the clip will be heard. The clip audio will be louder than the audio of the main track. When this is selected the main track will fade into the background and the audio of the clip will increase in volume, at the end of the clip the audio of the main track will increase again to full volume. Fade Clip - both the audio of the main track and the clip will be heard. The audio of the clip will play at 15% while the main track audio will play at 75%. 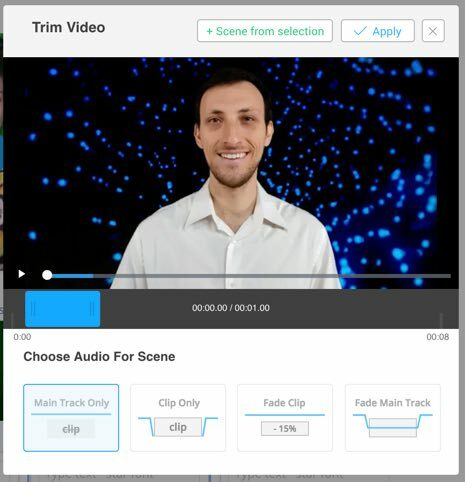 To choose the different selections simply click on the scissors icon above the desired segment, select the desired audio selection for that scene and click "apply". You can choose a different audio selection for each scene. Please note: The maintrack keeps playing at all times, even if it is not heard.